The only constant in life is this: Life is ever changing. Change is good. It keeps us moving in a forward motion, optimizing growth and preventing stagnation (which is never a good thing). But there are some “old-time” social traditions around gardening that are quickly becoming lost to the newest generations…traditions which may be worth reclaiming. With the onslaught of a fast-paced, social media-driven society, we experience (and enjoy) more interaction with a wider group of people. But at the same time, we are losing the one-on-one, heart-to-heart contact with individuals. I believe we can enjoy both forms of interaction with others, but it’s going to take more of an intentional effort to sustain the old ways of doing a one-on-one kind of life together. I was recently reminded of some of the old gardening traditions, involving friendship, while walking through the Cottage Creek garden. I often find myself fondly thinking of various friends while strolling in my flower gardens . It occurred to me that these friends were coming to mind because I was surrounded by various flowers/plants that I had planted from “starts” which had come from my friends’ flower gardens. 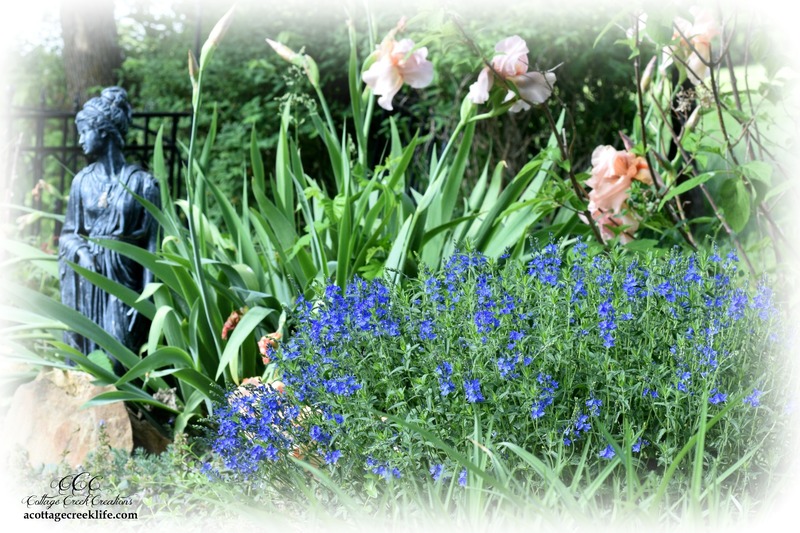 The Cottage garden is filled with “shared beauty”. Tiny dwarf iris, tall phlox, beautiful blue veronica, various varieties of ‘flag’ iris, yucca, shasta daisies, and a host of different succulents, lilies, and hosta, (among many more) serve as evidence of friendship, represented by those plants that have come from the gardens of friends and family. Back in the day, folks didn’t run to the garden center for spring plants. They saved (and shared) annual seeds, and they divided (and shared) their perennial plants with each other. Happy “blossoms of friendship” dotted yards and flower gardens all over the countryside. 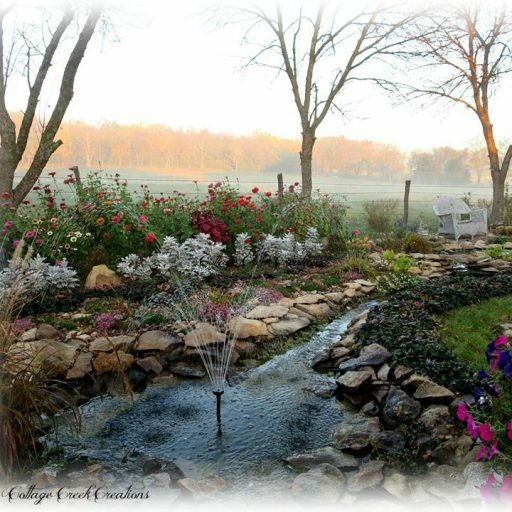 Friends strolled through each other’s yards/gardens, admiring the beauty, declaring, “Oh! I would love to have a start of THAT one!” People shared time, common interests, resources and friendship around the garden, as a part of daily life. Not that long ago, growing a vegetable and flower garden, saving the seeds, and sharing the harvest (including seeds/cuttings) with others was a normal way of life in America. I can still picture the rows of pie tins, with layers of drying seeds from the garden’s harvest, that were lined up on my grandmother’s back porch shelves. Seeds from watermelon, tomato, cucumber and many other types of flower/garden plants were dried and saved for the next season. Saving and sharing was a part of the gardening culture and it served to keep people connected to each other. Our commercialized world has brought faster, more convenient options for everything, including gardening. Convenience is good, lightening our load and bringing us more time for the things we love to do. But it can also take away some of the beneficial aspects of the ‘old ways of slower days’. On memorial day, cuttings from perennial shrubs, like lilacs and peonies, along with springtime perennial blooms like Iris, were gathered and placed on the graves of the loved ones, who had departed this life. Sharing blossoms with friends and neighbors, for that purpose, was a common practice. Many times, flowers from shrubs and plants that had been tenderly nurtured by the dearly departed were picked and lovingly placed on the gravesite, as an extra-special memorial to that person’s life. Another lost tradition is the sharing of May Baskets on May Day. Every May 1st, homemade “baskets” were assembled with flower starts and then hung on the door knobs of unsuspecting friends. The idea was to bless someone, anonymously, with a springtime gift. Teaching our newest generations about the ‘old ways’ might help rekindle interest in reclaiming some of those traditions. Young children love to hear stories about their parent’s and/or grandparent’s childhood experiences. My granddaughters were delighted, this spring, to make May Baskets with me -to secretly hang on the door knobs of unsuspecting neighbors. It was fun for them to imagine the surprised expressions on the faces of the recipients. That old tradition teaches children to think selflessly, taking the time and effort to care for others without expectation of even a ‘thank you’ in return. Finding satisfaction, purely from the act of giving to others with no strings attached, is an important personal value to cultivate. The memory of experiencing childhood joy through that simple tradition could potentially plant a seed of generosity into an innocent heart, which just might end up lasting a lifetime.